Here is a piece of C++ code that seems very peculiar. For some strange reason, sorting the data miraculously makes the code almost six times faster. Without std::sort(data, data + arraySize);, the code runs in 11.54 seconds. With the sorted data, the code runs in 1.93 seconds. Initially, I thought this might be just a language or compiler anomaly. So I tried it in Java. With a somewhat similar, but less extreme result. My first thought was that sorting brings the data into the cache, but my next thought was how silly that is, because the array was just generated. Why is a sorted array faster than an unsorted array? The code is summing up some independent terms, and the order should not matter. 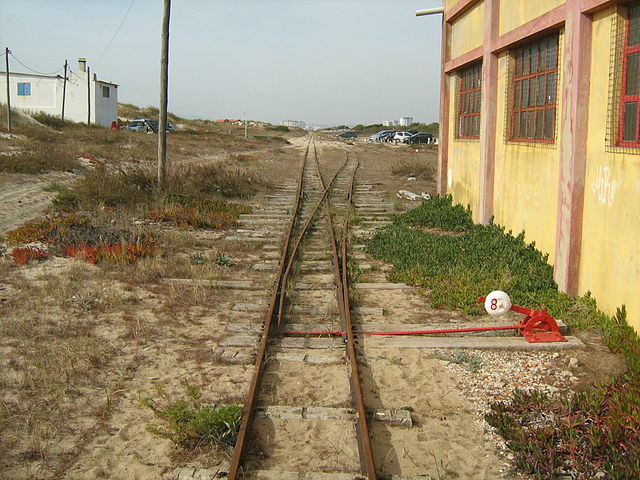 Image by Mecanismo, via Wikimedia Commons. Used under the CC-By-SA 3.0 license. Now for the sake of argument, suppose this is back in the 1800s - before long distance or radio communication. You are the operator of a junction and you hear a train coming. You have no idea which way it is supposed to go. You stop the train to ask the driver which direction they want. And then you set the switch appropriately. Trains are heavy and have a lot of inertia. So they take forever to start up and slow down. Is there a better way? You guess which direction the train will go! If you guessed right, it continues on. If you guessed wrong, the captain will stop, back up, and yell at you to flip the switch. Then it can restart down the other path. If you guess right every time, the train will never have to stop. If you guess wrong too often, the train will spend a lot of time stopping, backing up, and restarting. You are a processor and you see a branch. You have no idea which way it will go. What do you do? You halt execution and wait until the previous instructions are complete. Then you continue down the correct path. Modern processors are complicated and have long pipelines. So they take forever to "warm up" and "slow down". Is there a better way? You guess which direction the branch will go! If you guessed right, you continue executing. If you guessed wrong, you need to flush the pipeline and roll back to the branch. Then you can restart down the other path. If you guess right every time, the execution will never have to stop. If you guess wrong too often, you spend a lot of time stalling, rolling back, and restarting. This is branch prediction. I admit it's not the best analogy since the train could just signal the direction with a flag. But in computers, the processor doesn't know which direction a branch will go until the last moment. In other words, you try to identify a pattern and follow it. This is more or less how branch predictors work. Most applications have well-behaved branches. So modern branch predictors will typically achieve >90% hit rates. But when faced with unpredictable branches with no recognizable patterns, branch predictors are virtually useless. Further reading: "Branch predictor" article on Wikipedia. Notice that the data is evenly distributed between 0 and 255. When the data is sorted, roughly the first half of the iterations will not enter the if-statement. After that, they will all enter the if-statement. This is very friendly to the branch predictor since the branch consecutively goes the same direction many times. Even a simple saturating counter will correctly predict the branch except for the few iterations after it switches direction. If the compiler isn't able to optimize the branch into a conditional move, you can try some hacks if you are willing to sacrifice readability for performance. This eliminates the branch and replaces it with some bitwise operations. With the Branch: There is a huge difference between the sorted and unsorted data. With the Hack: There is no difference between sorted and unsorted data. In the C++ case, the hack is actually a tad slower than with the branch when the data is sorted. GCC 4.6.1 with -O3 or -ftree-vectorize on x64 is able to generate a conditional move. So there is no difference between the sorted and unsorted data - both are fast. VC++ 2010 is unable to generate conditional moves for this branch even under /Ox. If you give the Intel Compiler the branchless code, it just out-right vectorizes it... and is just as fast as with the branch (with the loop interchange).